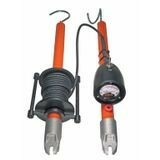 16kV PHASING TESTER KIT (Item Description: 16kV tester kit*) | Tallman Equipment Co., Inc. CHANCE Phasing Testers easily determine phase relationships and approximate voltage, line-to-line or line-to-ground. 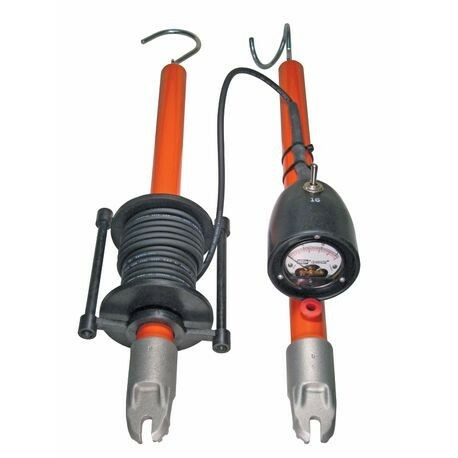 Each tester consists of two fiberglass poles with end fittings threaded for interchangeable probes. The probe fittings couple with a high-impedance component encased in each pole. To complete the test circuit, a 22-foot length of insulated flexible cable stores on the reel affixed to one pole and connects to the voltmeter on the other pole. Simple to operate, the probes can be brought into contact with the conductors appropriate for the meter to read phase-to-phase or phase-to-ground voltage.